Ariana Grande headlined a star-studded bill at the Old Trafford cricket ground in memory of the victims of the bomb attack following her concert in the city last month (May17), with performers including Coldplay, Justin Bieber, Miley Cyrus and Katy Perry. 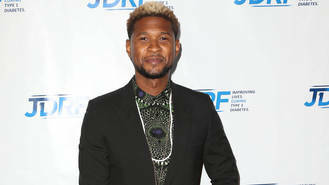 Usher's name appeared on the official line-up, but he did not appear at the show, and music fans took to social media to question where he was. The Yeah! singer has now taken to Instagram to explain his absence, insisting he wanted to perform, but had to be with his son. "So happy to see that last night's concert in Manchester proved that love always prevails," he writes on the social media site. "I would have loved to be there but It was my son's first day at Camp Kudzu, one of the few summer camps for kids living with diabetes. This was an important day for him and for myself as a proud father. Stay strong UK." On Sunday (03Jun17), Usher shared links to websites where fans could tune into a live stream of the event on his Twitter page. He also posted an emotional video message about the event on Instagram. One Love Manchester raised more than $3 million (£2.3 million) for the Manchester Emergency Fund, as established by the British Red Cross.